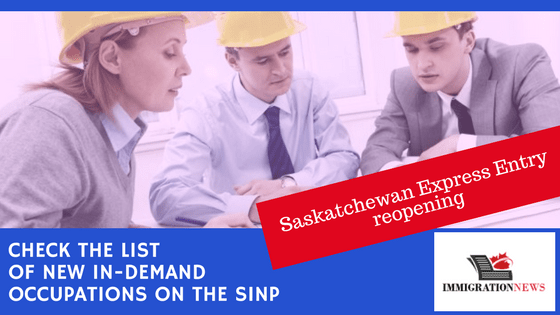 A list of additional 43 in-demand occupations is now available in the International Skilled Worker – Express Entry, a sub-category of the Saskatchewan Immigrant Nominee Program (SINP). This sub-category is aligned with Canada’s Express Entry immigration selection system. Resulting in an award of 600 additional Comprehensive Ranking System (CRS) points and an Invitation to Apply (ITA) for permanent residence during a subsequent draw from the pool, eligible candidates in the Express Entry pool with work experience in one of occupations below may be qualified to apply for a provincial nomination under the SINP. In an effort to fill labor needs, up to 600 new applications will be accepted during this intake period. And the best news about this is that the applicants don’t need a job offer to apply. The SINP International Skilled Worker – Express Entry sub-category operates on a first-come, first-served basis. 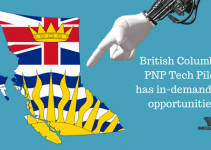 And the requirements for the program are: proof of legal status, if currently living in Canada; an Express Entry Profile Number and Job Seeker Validation Code; score a minimum of 60 points out of 100 on the SINP point assessment grid. Also, to be eligible, you must provide language test results from a designated testing agency that match the language level declared in the Express Entry profile; have completed at least one year of post-secondary education or training which is comparable to the Canadian education system and which has resulted in a degree, diploma, or certificate; have a minimum level of work experience related to their field of education or training in a highly skilled occupation (NOC 0, A, or B) that is considered to be in-demand in Saskatchewan (See in-demand occupations list below). NOC means National Occupation Classification. Twelve months work experience in Canada in the past three years (trades and non-trades). 211 Engineering managers Provide documentation from the Association of Professional Engineers and Geoscientists of Saskatchewan (APEGS) showing your Engineer-in-Training membership; or a letter from APEGS indicating that you have been assigned Confirmatory Exams. 2131 Civil engineers Provide documentation from the Association of Professional Engineers and Geoscientists of Saskatchewan (APEGS) showing your Engineer-in-Training membership; or a letter from APEGS indicating that you have been assigned Confirmatory Exams. 2132 Mechanical engineers Provide documentation from the Association of Professional Engineers and Geoscientists of Saskatchewan (APEGS) showing your Engineer-in-Training membership; or a letter from APEGS indicating that you have been assigned Confirmatory Exams. 2133 Electrical and electronics engineers Provide documentation from the Association of Professional Engineers and Geoscientists of Saskatchewan (APEGS) showing your Engineer-in-Training membership; or a letter from APEGS indicating that you have been assigned Confirmatory Exams. 2141 Industrial and manufacturing engineers Provide documentation from the Association of Professional Engineers and Geoscientists of Saskatchewan (APEGS) showing your Engineer-in-Training membership; or a letter from APEGS indicating that you have been assigned Confirmatory Exams. 2147 Computer engineers (except software engineers and designers) Provide documentation from the Association of Professional Engineers and Geoscientists of Saskatchewan (APEGS) showing your Engineer-in-Training membership; or a letter from APEGS indicating that you have been assigned Confirmatory Exams. 2151 Architects Provide your “Academic Certification” documentation from the Canadian Architectural Certification Board (CACB), Or Documentation from the Canadian Architectural Certification Board (CACB) showing your acceptance into the Broadly Experienced Foreign Architect (BEFA) program including an invitation to apply to the self-assessment phase (2nd step). – Certified Membership as an Information Technology Certified Professional of Canada (ITCP). 4214 Early childhood educators and assistants Provide documentation from the Ministry of Education showing your eligibility for Early Childhood Educator Certification. 3211 Medical laboratory technologists Provide a copy of your valid licensure (temporary or provisional) from the Saskatchewan Society of Medical Laboratory Technologists. 3216 Medical sonographers Provide documentation from Sonography Canada showing your eligibility to challenge their qualifying examinations OR Provide your Examination Confirmation Letter (ECL) or proof of Sonography Certification from the American Registry for Diagnostic Medical Sonography (ARDMS).Note: ARDMS examinations can be written in various testing centres worldwide through Pearson VUE. 6331 Meat cutters As per Immigration, Refugees and Citizenship Canada’s Express Entry requirements, Express Entry applicants will need to provide a certificate of qualification from the Saskatchewan Apprenticeship and Trade Certification Commission (SATCC), which requires a trade qualifier assessment (step 1) and requires individuals to write exams in Saskatchewan (step 2). 7231 Machinists As per Immigration, Refugees and Citizenship Canada’s Express Entry requirements, Express Entry applicants will need to provide a certificate of qualification from the Saskatchewan Apprenticeship and Trade Certification Commission (SATCC), which requires a trade qualifier assessment (step 1) and requires individuals to write exams in Saskatchewan (step 2). 7272 Cabinetmakers As per Immigration, Refugees and Citizenship Canada’s Express Entry requirements, Express Entry applicants will need to provide a certificate of qualification from the Saskatchewan Apprenticeship and Trade Certification Commission (SATCC), which requires a trade qualifier assessment (step 1) and requires individuals to write exams in Saskatchewan (step 2). 7311 Industrial mechanics As per Immigration, Refugees and Citizenship Canada’s Express Entry requirements, Express Entry applicants will need to provide a certificate of qualification from the Saskatchewan Apprenticeship and Trade Certification Commission (SATCC), which requires a trade qualifier assessment (step 1) and requires individuals to write exams in Saskatchewan (step 2). 7312 Heavy-duty equipment mechanics As per Immigration, Refugees and Citizenship Canada’s Express Entry requirements, Express Entry applicants will need to provide a certificate of qualification from the Saskatchewan Apprenticeship and Trade Certification Commission (SATCC), which requires a trade qualifier assessment (step 1) and requires individuals to write exams in Saskatchewan (step 2). 7321 Automotive service technicians, truck and bus mechanics As per Immigration, Refugees and Citizenship Canada’s Express Entry requirements, Express Entry applicants will need to provide a certificate of qualification from the Saskatchewan Apprenticeship and Trade Certification Commission (SATCC), which requires a trade qualifier assessment (step 1) and requires individuals to write exams in Saskatchewan (step 2). 7322 Motor vehicle body repairers As per Immigration, Refugees and Citizenship Canada’s Express Entry requirements, Express Entry applicants will need to provide a certificate of qualification from the Saskatchewan Apprenticeship and Trade Certification Commission (SATCC), which requires a trade qualifier assessment (step 1) and requires individuals to write exams in Saskatchewan (step 2). 7237 Welders As per Immigration, Refugees and Citizenship Canada’s Express Entry requirements, Express Entry applicants will need to provide a certificate of qualification from the Saskatchewan Apprenticeship and Trade Certification Commission (SATCC), which requires a trade qualifier assessment (step 1) and requires individuals to write exams in Saskatchewan (step 2). How can we help you (2 EASY STEPS)? 1-Fill Mercan Group Free Assessment. 2-Check your email regularly and Wait for our professional immigration team to give a full assessment feedback on how to proceed and what are the next steps. Do you want to come to Canada?Contact Mercan Group and make applying for a Visa a simple process. Mercan Group has the experience and expertise to guide you through your application process, from the selection of immigration category to preparing and filing your application, preparing you for an interview and following up with the Visa Office.How can we help you? Join our mailing list to receive the latest news and updates from our team of immigration experts. Journalist from Rio de Janeiro currently writing about Immigration in Montreal, Quebec. I'm passionate about culture, arts, communication and internet. And if you admire Canada as much as me and want to keep updated, this blog is the right place for you. Join our mailing list to receive the latest news and updates about Canadian Immigration. Canada Immigration News Copyright © 2019.